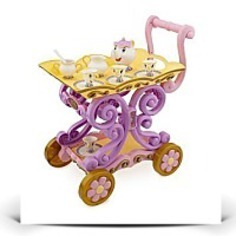 Belle Magical Tea Set Set Includes: Tea cart 21'' H (including handles) x 17'' W x 12'' D? 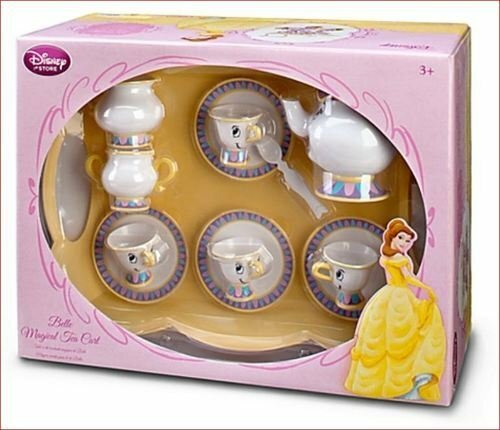 4 Chip cups 2'' H? Wash thoroughly before initial use Adult assembly required Plastic Ages 3+? Sugar bowl 2 1/2'' H? Removable serving tray 16'' W x 12'' L? Imported Creamer 2 3/4'' H? 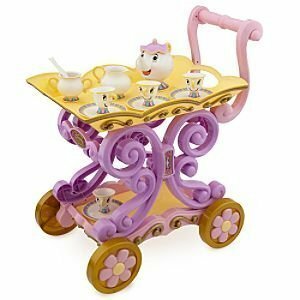 Mrs. Potts 5'' H? Spoon 4'' L? 4 saucers 4 1/4'' Diameter Additional Information: Working wheels?